Used in many countries and by various international and multilateral institutions to facilitate sound and informed planning and decision-making, impact assessment (IA) has a worldwide appeal. IA requirements are usually codified into laws and/or its application is guided by clear regulations or guidelines. The development and successful application of impact assessment is at various stages – from embryonic to advanced – in different countries. In all cases, however, there is strong emphasis on the usefulness of early application (planning stages in the lifecycle of given actions), scoping (identification of impacts), mitigation of significant impacts, and monitoring and management as well as stakeholder involvement. Impact assessment is serving its purpose well and delivering results, but naturally we cannot assume that IA is without its challenges and weaknesses. IAIA, as the leading global network on best practice in the use of impact assessment, continues to rally professionals in enhancing capacity and knowledge and broadening the reach of impact assessment. As IAIA members and impact assessment professionals, we have an obligation to routinely reflect on impact assessment practice in order to identify areas of shortcomings and failures for examination and possible resolution. Critiquing ourselves is one of the essential means of facilitating continuous improvement and inspiring acceptance of impact assessment, as well as providing the opportunity and the benefit of extending its scope and influence. IAIA members should never shy away from self-criticism of our profession, not even at the risk of being accused of demonizing the impact assessment profession or practice. We should be challenged by the expected notion that impact assessment can, and should do more, rather than become complacent in our achievements and bask in past glory. I wish to draw attention to an example of a challenge that could engage insightful consideration: the voluminous (and scary) impact assessment reports. Though they may appear rather simple for us as IA professionals, it’s a whole big deal for our stakeholders out there. Many consultants (including myself), have been confronted by civil society organizations and community stakeholders about voluminous IA reports, and whether they were meant to be read and understood within often-limited timeframes. By producing such reader-unfriendly documents, we succeed in alienating a large group of potential readership and losing their support and the acceptance of impact assessment documents as expediently addressing their interests. We may also inadvertently lend credence to allegations by critics that IA documents are mere academic treatise. 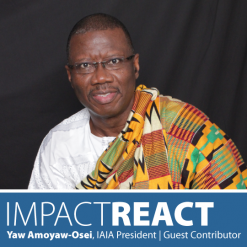 Yaw Amoyaw-Osei is the Director of CEHRT Environmental Consulting in Tema, Ghana, and currently serves as President of the IAIA Board of Directors.